I've been an entrepreneur since the age of 15. Once in high school and twice when I was just married, I attempted employment. It didn't take. The high school job lasted 4 hours and the other two, several months each (I had a father-in-law by then and needed to impress). Over the past forty years I started 19 businesses. Most barely put food on the table. Some lost money. Some did okay. One is still doing very well and the jury is out on my latest. All were bootstrapped. My college education was in the biological sciences so what I know about business I learned by reading, doing, making mistakes, trying again. Failure is a great, if unforgiving teacher. An MBA would have been much cheaper and easier on my family. By nature I'm a very private person. I'd rather invent, code, or motivate my staff than blog or twitter. But I realize there is great value in the new social web. So I'm learning to share what I know, find, and think. This is the only public page on the Keziah domain. You can find more information from the links provided on the right. 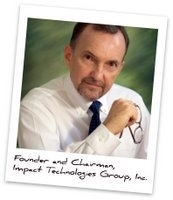 Most of my attention is occupied by my role as Founder and Chairman of Impact Technologies Group, Inc.